Home » Shop And $ave At The Village Plaza! Shop And $ave At The Village Plaza! Click here for money saving offers at Mezza Luna, Village Plaza Car Wash, CKO, Dunkin’ Donuts, China Chef, Peace N Joy Academy, The Bagel Peddler, Kumon and R&R Hair and Beauty Salon! It was a chance trip to a township restaurant that led the owners of Rosalind’s Fashion to pick Franklin as their store’s new home. 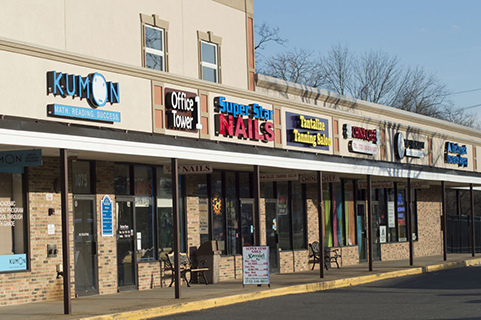 The store, located in the Village Plaza shopping center at 1075 Easton Ave., held its grand opening on March 31. It occupies the space formerly held by longtime tenant R&R Printing. Co-owner Mona Davis said it was the couple’s 11-year-old son, Nathaniel, who first saw the space. “We came over here, looked in the window, and a week later” signed the lease, she said. That was in early March, she said. “This place was totally gutted out,” said co-owner Tim Davis, Mona’s husband. Tim Davis said that he sat in the parking lot one day to see what kind of traffic the plaza generated. “I spoke with my wife and she loved it, and here we are,” he said. The couple, who live in Plainfield, was already familiar with Somerset through their son’s soccer activities, Tim Davis said. Rosalind’s Fashions got it’s start two years ago in Plainfield, about a year following the death of Mona Davis’ mother. “We had a two-year stint in Plainfield, and when our lease was up, we moved on to bigger and better things,” Tim Davis said. The store stocks a variety of women’s fashion items, from dresses, jumpsuits and leggings to jeans, sweaters and purses. “Pretty much, we cover everything,” Mona Davis said. Mona Davis said she’s loved fashion since she was a little girl. The store will be open from 10 a.m. to 6 p.m. seven days a week until the couple sees what customer traffic is like, Mona Davis said.